Grace Kelly, aka EZ Amazing Grace, is a beautiful 9½-year-old white and black female born April 1, 2001. Her sire is Oshkosh Slammer, and her dam is Cass Rikter, making her full sibling to GALT's Fanny. 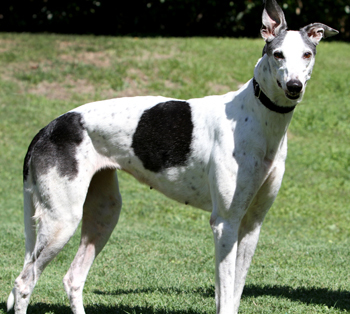 Grace Kelly was quite the racer with 142 active races, starting December 17, 2002, in Tampa, FL, and moving back and forth to Derby Lane for 3 years. She then raced at Tri State in West Virginia, before finishing her career at Southland in West Memphis, AR, on February 6, 2006. 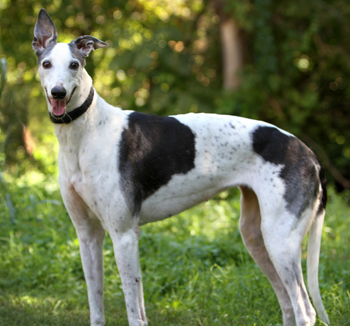 Grace Kelly had a litter of 3 registered pups in August 2009, sired by ICU Smooth Move. All of those days are now behind her, and this girl is ready to find her forever couch! It is not known at this time if Grace Kelly is small animal or cat tolerant.